Brian Goodsell, Owner of Fallow Hollow Deer Farm was slightly amused by the nest of debris that I was accumulating for my blind. I had tried several times before to ambush a fallow deer to no avail. They tended to be a lot more aware of their surroundings than I thought at first . I finally hit upon the idea of making a blind large enough to hold me, my atlatl, and dart in the loaded position. I had discovered that any movement of the dart gave my position away. In fact if these fallow deer were to see me blink, they would be gone when my eyes were open again. The only way around this problem was to become totally invisible. I had checked the hardware store for invisible spray but they were fresh out. So it left me with no alternative other than dragging in as much forest litter as it would take to bury Brian’s tractor. I left a few look out points in my giant nest, taking advantage of natural shooting lanes. Brian asked me if I thought I was ready and I said “yea, to lay eggs”. We were using atlatls and stone pointed darts, all of which, I had made myself. I thought to myself; with this primitive gear I really would be laying an egg if don’t eventually get a deer with them. I have killed wild boar with atlatls before but they are a much slower moving creature than these fallow deer. “Lets do it ” Said Brian as he walked off in the direction he had last seen deer. His plan was to slowly drive deer in my direction, which was deep in the woods. He could easily locate deer out in the fields where they are visible from over a quarter mile away. Its been my experience that if you can see them they can surely see you. If you move in their direction they seem to melt away into the woods long before you get there, which would work nicely into our plan today. Earlier, Jim Shuler and his daughter Carrie had tried to ambush deer but they had little success, not because they didn’t see any but because when they did see them, hunter and hunted were looking into each other’s big brown eyes. Jim is a wild life management biologist and I invited him to hunt with us to get his opinion on this kind of hunting. This is the first time this kind of hunting has become readily available, thanks to the Goodsells who have looked at Atlatl hunting as one more way to market their product, the fallow deer which they raise on their farm. One fear I had at first was that hunting in an enclosed area would be too easy, but the hunting area is so large and the deer so skittish that that fear proved to be without substance, especially since we plan to hunt mainly with atlatls. Jim had secreted himself a few hundred feet away from me on one side and Carrie hid in some thick pines on the other side about the same distance away. I heard deer coming but when I strained to see them they were scampering along the edge of the woods about two hundred feet away. I hoped that Jim would get a shot. Meanwhile, Carrie stood quietly While a couple of does crept up the creek between us. Three came within about 15 yards from me and started drinking from the creek. The deer closest to me was obscured by some brush so I chose to shoot at the one in the middle, besides she was the largest of the three. There was a branch between me and the doe but with an atlatl you can arch over obstructions. I drew an imaginary line in the air with my eyes just as the deer presented a nice quartering away shot. I let the dart fly with just the right amount of force to clear the top of the branch. As the dart reached its apex, the doe turned toward me. She had completely flipped around when the dart struck. The seven foot ash shaft sank deeply into her flesh and protruded out the other side. She dashed by me with the dart obviously transfixing her vitals. As she went past a large oak she suddenly turned into it to break the dart off as she past it by. The 9/16 th inch hardwood shaft snapped like a toothpick as she bounded toward where Carrie stood. I listened intently as the deer crashed through the underbrush. Then silence. I knew it was all over but not exactly where. I stayed where I was until Brian came walking slowly toward me. I gave him the thumbs up signal. We followed the blood trail to the oak tree, then off into the pines, and across the creek collecting Carrie as we went. Somewhere along the way Jim also appeared and we fanned out in the direction of the blood trail. It was only moments later and Brian yelled “Here she is.” I was glad to prove to myself that I could harvest a fallow deer with “sticks and stones, and horns and bones” I guess I knew it all along but I didn’t realize how really challenging it would be. You see, this was the fifth time I tried to accomplish this task, with no success until now. Both Jim and Carrie said that they enjoyed the hunt. I think we all agreed that it was a little trickier than anticipated. What we liked best was the fast action of the hunt, with plenty of chances to see deer. The challenge was to stay absolutely still until you got your shot. Jim did indeed get a few shots but he unfortunately missed. Jim’s hunting skills far exceed mine but I had more luck with the atlatl that day. Aztec Atlatl Battle is a field game that pits two teams consisting of eight atlatlists against each other. Each team will have one person designated “Chief” and one person designated “Shaman”, all other players are designated “warriors”. The 12 yard by 80 yard playing field represents a section of causeway that once linked the Aztec city of Tenochchitlan with the mainland. Each atlatlist must have an atlatl and three darts. In addition each contestant must be represented by a target made from ethelfoam or similar material that is 24″ square and two inches thick. Radiating concentrically from the center, the targets must have a 6″ inner circle of blue, around that is a twelve inch circle of red , and outside that is the final ring of 20 ” in yellow. The targets are held off the ground by hardwood tripods three feet high. The tripods should be of a design to be able to be easily moved with “feet” that allow them to be planted sturdily into the ground yet hold the target center 3 feet from the ground. The field of play is cordoned off with rope or tape in a rectangle 12 yards by 80 yards inside a safety zone 50 yards by 120 yards. The playing field is divided into eight 10 yard sections called zones. The play occurs in rounds. In each round each person shoots the amount of darts allotted to him or her from directly behind his or her respective target. Each person starts with 3 darts. Regardless of the order of shooting everyone gets to shoot all of his allotted darts for that round. For safety’s sake only one shooter is allowed on the field at a time. The order of shooting is of no importance and may be determined by the Judge. Everyone must be ready to take his or her turn as it comes to keep the game moving. After everyone has shot, the round is over and the “dead” are removed from the field. The wounded give up one or two of their darts. Those hit in the yellow ring give up one dart and those hit in the red must give up two darts. Anyone hit in the blue is considered dead. The Shaman reside in their respective end zones. Shaman are not allowed to move to any other zone but they may move to any location in the end zone that they desire. Chiefs are allowed to move to any zone except their opponents end zone, at the end of a round. No one may move beyond or into a zone occupied by a “live” opponent. In other words a person may not move past the “war front”. However after a round where all opposing soldiers are killed in a particular zone the zone may be occupied by any one who is in position, when the round is over. Warriors may be in any zone except the end zones, however they must move only one zone at a time between rounds. At the beginning of the game the Chief and Shaman start in the end zone and two warriors start in each of the other zones at their respective ends of the field, so two contestants will occupy each of the zones at first. The Shaman may allow the Chief to shoot his three darts if he so desires, as long as the chief is alive. The Chief may shoot the Shaman’s darts from behind his own target regardless of his location on the field. It is the duty of the Chief to direct his team, be he dead or alive. At the beginning of the game the chief determines the placement of his team members targets. A very important part of the game is the strategy and game plan. Each team should be constantly trying to devise a plan to foil their opponent. It is recommended that each team provide their own tent on opposite sides of the field for shade from the sun. It will also make it safer than to have people roaming around if people stay in the general area of their tent. A field judge shall be chosen who is familiar with the rules of the game and general safety rules of the sport. All decisions of the Judge are final as to scoring. In addition to this the Judge has the right to dismiss anyone violating safety rules from the field. The Judge may appoint a Safety Assistant to watch the field for safety problems. Both the Judge and his Assistant shall have a whistle, which when blown shall stop all shooting. After the safety issue has been resolved, the Judge may resume play with a verbal signal. This is a preliminary draft of the rules of this game. The rules may need to be changed as necessary to assure the safety first of all and the fairness of play. This game is authored by Robert S. Berg of Thunderbird Atlatl, Copyright 2000. Brian Goodsell, Owner of Fallow Hollow Deer Farm was slightly amused by the nest of debris that I was accumulating for my blind. I had tried several times before to ambush a fallow deer to no avail. They tended to be a lot more aware of their surroundings than I thought at first . I finally hit upon the idea of making a blind large enough to hold me, my atlatl, and dart in the loaded position. I had discovered that any movement of the dart gave my position away. In fact if these fallow deer were to see me blink, they would be gone when my eyes were open again. The only way around this problem was to become totally invisible. I had checked the hardware store for invisible spray but they were fresh out. So it left me with no alternative other than dragging in as much forest litter as it would take to bury Brian’s tractor. I left a few look out points in my giant nest, taking advantage of natural shooting lanes. Brian asked me if I thought I was ready and I said “yea, to lay eggs”. We were using atlatls and stone pointed darts, all of which, I had made myself. I thought to myself; with this primitive gear I really would be laying an egg if don’t eventually get a deer with them. I have killed wild boar with atlatls before but they are a much slower moving creature than these fallow deer. “Lets do it ” Said Brian as he walked off in the direction he had last seen deer. His plan was to slowly drive deer in my direction, which was deep in the woods. He could easily locate deer out in the fields where they are visible from over a quarter mile away. Its been my experience that if you can see them they can surely see you. If you move in their direction they seem to melt away into the woods long before you get there, which would work nicely into our plan today. Earlier, Jim Shuler and his daughter Carrie had tried to ambush deer but they had little success, not because they didn’t see any but because when they did see them, hunter and hunted were looking into each other’s big brown eyes. Jim is a wild life management biologist and I invited him to hunt with us to get his opinion on this kind of hunting. This is the first time this kind of hunting has become readily available, thanks to the Goodsells who have looked at Atlatl hunting as one more way to market their product, the fallow deer which they raise on their farm. One fear I had at first was that hunting in an enclosed area would be too easy, but the hunting area is so large and the deer so skittish that that fear proved to be without substance, especially since we plan to hunt mainly with atlatls. Jim had secreted himself a few hundred feet away from me on one side and Carrie hid in some thick pines on the other side about the same distance away. I heard deer coming but when I strained to see them they were scampering along the edge of the woods about two hundred feet away. I hoped that Jim would get a shot. Meanwhile, Carrie stood quietly While a couple of does crept up the creek between us. Three came within about 15 yards from me and started drinking from the creek. The deer closest to me was obscured by some brush so I chose to shoot at the one in the middle, besides she was the largest of the three. There was a branch between me and the doe but with an atlatl you can arch over obstructions. I drew an imaginary line in the air with my eyes just as the deer presented a nice quartering away shot. I let the dart fly with just the right amount of force to clear the top of the branch. As the dart reached its apex, the doe turned toward me. She had completely flipped around when the dart struck. The seven foot ash shaft sank deeply into her flesh and protruded out the other side. She dashed by me with the dart obviously transfixing her vitals. As she went past a large oak she suddenly turned into it to break the dart off as she past it by. The 9/16 th inch hardwood shaft snapped like a toothpick as she bounded toward where Carrie stood. I listened intently as the deer crashed through the underbrush. Then silence. I knew it was all over but not exactly where. I stayed where I was until Brian came walking slowly toward me. I gave him the thumbs up signal. I was glad to prove to myself that I could harvest a fallow deer with “sticks and stones, and horns and bones” I guess I knew it all along but I didn’t realize how really challenging it would be. You see, this was the fifth time I tried to accomplish this task, with no success until now. Both Jim and Carrie said that they enjoyed the hunt. I think we all agreed that it was a little trickier than anticipated. What we liked best was the fast action of the hunt, with plenty of chances to see deer. The challenge was to stay absolutely still until you got your shot. Jim did indeed get a few shots but he unfortunately missed. Jim’s hunting skills far exceed mine but I had more luck with the atlatl that day. Bob Berg of Thunderbird Atlatl invited me to go on an atlatl hunt for fallow deer. I’ve hunted whitetails in New York with both bow and gun for over twenty years, and hunted the Rockies for mulies, too. I have been competing with the atlatl for the last three years, but never hunted with it. When Bob told me this hunt was on the house, I couldn’t say yes fast enough! Bob is starting a guiding service for atlatlists and traditional archers, and he wanted to use a guinea pig (me) to make sure everything was ready for paying customers. The hunt took place on an ex-dairy farm near Candor, New York, the town where Bob lives. The main purpose of the farm is to raise venison for restaurants. The 400+ acre farm is surrounded by a fence 10 feet high, with interior fencing dividing the land in to smaller parcels. The hunting parcel is about 125 acres. Only atlatls and bows are allowed. I’ve never hunted inside a fence, and did have some reservations about doing so. Any notion that this would be too easy was soon erased, however. Bob took me to stand number one. It utilized some standing trees, with branches piled up for concealment. After I got settled in, Bob left to start the drive. It wasn’t long before the first deer came in to view. Man, were there a lot of eyes! These fallow deer travel in groups, from two to twenty+, with the larger groups being more common. Each group is led by an older and very wary doe, and they travel in single file. I was hunting for a doe, as the bucks are considerably more expensive and my free hunt wouldn’t be so cheap if I took a buck! Some of those racks were mighty tempting, however. Anyway, it didn’t take long for the first group to spot me, and make tracks. When the next group arrived, I was already in the throwing position (and spent the better part of the hunt like that!). It took a few minutes before a doe presented me with a reasonable opportunity, and I took it. I don’t know if it was the feeling of claustrophobia that I had in the blind, or just a fear of being spotted, but I didn’t get the throwing arm all of the way back. The dart fell short (and I got a dandy flute to run from the tip back to the base on the burlington snyder point when it hit a rock). The second throw was deflected by a branch, but the point on that dart survived. Bob came in, and it was time for plan B (after Bob and I built a new blind at another location). Bob led me to a spot in a hedgerow. I was concerned about the cover being a little sparse, but I have had good results with the camo pattern I was wearing, so gave it a try. Bob conducted another drive. I saw dozens of deer, but my concerns about being exposed were valid, and I wasn’t presented with any real good shots. I may have been able to throw at deer over towards the fence, but there is a gentleman’s rule forbidding that, as it certainly isn’t sporting. So the next idea was to use the new blind that we had constructed. We sacrificed some concealment for more throwing freedom with this stand, but it was in the woods and was better than the hedgerow stand for remaining unnoticed. Bob again drove deer to me, and after a time a doe gave me another chance. Once again, my dart was deflected by a branch, and the deer ran off. 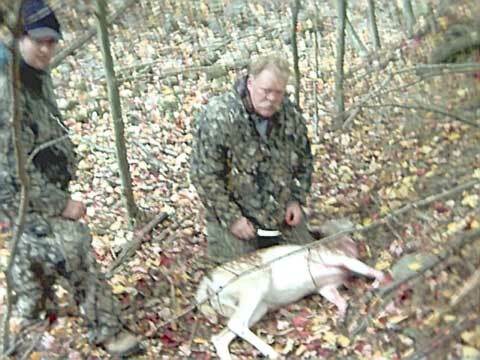 It wasn’t long before another group wandered in, and a doe became a target. This time I hit a tree just a few feet out, at a surprising height! Then I remembered photos of atlatlers in action which show that the dart is quite high early in its trajectory. The photos also show considerable flexing of the dart as it flies. This flexing means that a dart needs more room without obstructions than one would think. I learned that it is very difficult indeed to effectively use an atlatl in wooded conditions. Each of the four throws would have been very reasonable archery shots. I didn’t get a chance to make a bigger fool of myself, as it was starting to get dark, and the hunt was over. I didn’t get a deer, but I learned a lot about using the atlatl in earnest. And I had great fun! There was very little time when there weren’t deer around. It was the most fun I’ve ever had afield. I highly recommend booking a hunt with Bob. With atlatl hunting being illegal almost universally, this type of preserve hunt is about the only option for atlatl hunters. But it is very challenging option! Yes, the deer are in a fence, but they are mighty wary and tough to get when using primitive equipment. While the 125 acres gives the deer plenty of room to evade and escape the hunter, the fence does make it possible for your guide to keep you in the action throughout your hunt. And should you get a poor hit, the confined area will allow your animal to be found very quickly, which is more humane than a similar situation on free ranging animals. Keep in mind that I just hunted for part of an afternoon. Paid hunts will offer more time afield and plenty of opportunity for success. Atlatlers should practice in the woods beforehand, and not just in the open like many of us do for competition practice. Also, if you can’t stand to risk your knapped points, modern broadheads are allowed. Bob offers a wide range of prices (you can save some money by hunting in a group) and has some lodging opportunities that range from camping to bed and breakfast. He also has some combination atlatl workshops and hunts. Contact Bob at this email address! I have been experimenting with atlatls well over a decade. In my experiments with the atlatl I have never been able to experience any improvement in speed, power, energy, penetration, or distance using an atlatl weight that couldn’t be attributed to the atlatlist throwing harder. It has, however been my experience that an atlatlist can maximize the energy put into the shot by developing good form and simply putting more exertion into it. There is in fact a little energy stored in the bending shaft. The amount of energy this represents is so small compared with the total energy of the system that I contend that it is negligible. However, the atlatl weight and flexible shaft in fact do something positive. My theory is that the atlatl weight adds stability to the cast by slowing it down a bit and keeping everything in line, more or less, depending on the delivery method used by the atlatlist. It all has to do with inertia. The weight slows down the cast at the beginning because inertia has to be overcome with energy. The critical initial moments of the cast determine the direction the dart will fly. Slowing this part down can gain the atlatlist a little time to move the body forward, without changing the direction of the dart too much. It also requires energy to overcome the inertia of the atlatl (including the weight and the weight of the dart) to push the dart out the critical initial alignment. Once the atlatl is in motion the extra mass keeps everything going in that same critical direction. At the moment when the wrist begins its downward snap at the end of the cast, the direction of the dart has been established and from here out, power added to the system is the critical issue. This is where the flexibility of the atlatl releases the small amount of energy stored back into the cast. It’s not a lot but it’s nice to get it back. It’s a little like the interest they pay you on your checking account. It’s not a lot but it’s nice to get. You can do a little experiment to see how much energy there really is by bracing your atlatl in a vise, knocking the dart and putting approximately the amount of force against and letting it go. The dart will jump a few inches at most which to me is fairly unimpressive compared to the amount of energy I can add to the system just by exerting myself a little more at the end of the cast. (By the way, exerting yourself at the beginning of the cast is counter productive as it tends to deflect the initial direction of the dart. It also over flexes the dart and creates a lot of lateral motion which results in a lot of dart wobble.) Others have theorized that there is a relationship having to do with energy stored briefly during the shot in the bending dart shaft, and in the bending atlatl shaft. It is these together with the mystical properties of the atlatl weight, according to the popular theory which creates energy. I don’t think so. This idea defies logic and the laws of physics. The closer to the distal end one places the weight, or the heavier the weight, the more energy is required to get the atlatl in motion, the weight being mass with inertia to overcome. It can be argued that that inertia gets transferred to the dart through spring tension release, but I submit to you that no matter what you do, you can’t get any more out of the system than you put into it.